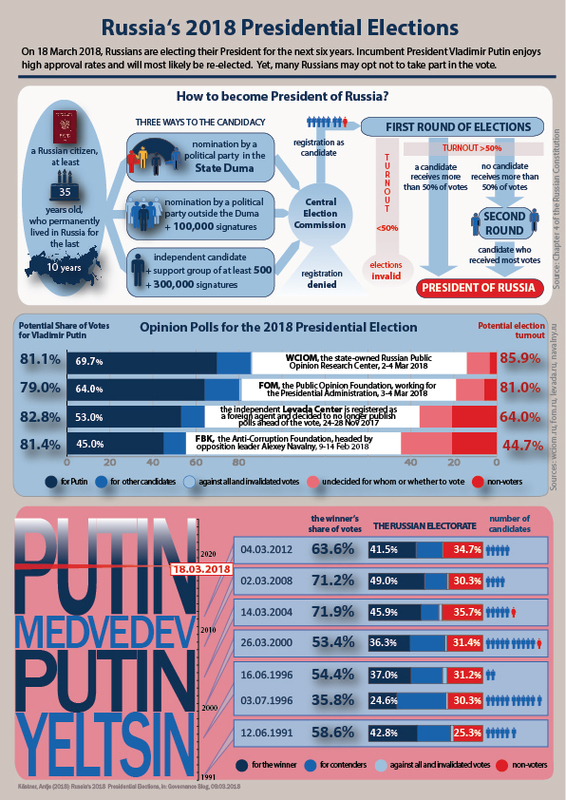 09/03/2018 12 comments on "Infographic: Russia’s 2018 Presidential Elections"
On 18 March 2018, Russians are electing their President for the next six years. Incumbent President Vladimir Putin is enjoying high approval rates and will most likely be re-elected. Yet, many Russians may opt not to take part in the vote. The infographic is putting Russia’s presidential elections of 18 March 2018 into context. In three sections, it explains how to become President of Russia, what opinion polls by the leading Russian pollsters tell us about the potential voting behaviour of Russians, and how these projections compare with previous presidential elections. The President of the Russian Federation is elected by absolute majority vote through a two-round system. His tenure is restricted to two consecutive terms. Yet, with effect from the 2012 presidential elections, the presidential term was extended from four to six years. In line with Article 81 of the Constitution of the Russian Federation, a candidate for president must hold Russian citizenship, be at least 35 years of age and have permanently resided in Russia for the last ten years. A candidate can be nominated by one of the political parties represented in the State Duma, the lower chamber of Russia’s parliament. A candidate can also be nominated by a political party outside the State Duma. A respective candidate has to submit to the Central Election Commission 100.000 signatures supporting his or her candidacy. A candidate can also register independently of any political party. He or she needs to collect at least 300.000 signatures in support of his or her application and prove to have a support group of at least 500 Russian citizens. Incumbent President Vladimir Putin as only independent candidate. For the elections of 18 March 2018 to be valid, more than half of all registered voters need to participate. If a candidate in the first round receives more than 50% of the vote, he is elected President of the Russian Federation. If, however, no candidate gains more than half of all votes, the two candidates who received most votes will compete in a second round of elections on 8 April 2018. The winner of this second round will then become President of Russia. The second section of the infographic is visualising the results of pre-electoral surveys published by four Russian polling agencies, which differ in their proximity to Russia’s ruling elite. While all of them predict that incumbent President Vladimir Putin would be re-elected in the first round, they considerably diverge regarding the potential voter turnout. The Levada Center, Russia’s last independent pollster, who since 2016 is registered as a “foreign agent”, predicted in their survey in late November 2017, that only 64% of Russian citizens would take part in the ballot. To avert persecution by the Russian authorities, the Levada Center since announced not to publish further pre-election polls. The Anti-Corruption Fund (FBK) of opposition leader Alexey Navalny eventually put turnout at merely 55.3% (survey of 9–14 February 2018). So, we see that with growing distance to the government, Russian pollsters are predicting a lower election turnout. These predictions are still well over the 50% mark, so that there seems to be no serious risk for the vote to be invalid. Nevertheless, a low turnout would undercut the government’s effort to boost their legitimacy through the vote. According to a deputy governor of one of Russia’s regions, the Kremlin pursues a turnout of 70% with 70% of votes cast for Putin. This would mean that 49% of all entitled voters would have to re-elect the incumbent. All four pollsters predict that Putin will be re-elected with around 80% of the vote. This exceeds the Kremlin’s benchmark and would somewhat compensate for a potentially low turnout, giving Putin more than the aspired 49% approval among the entire Russian electorate. When expressed as share of the entire Russian electorate, however, approval for Putin is considerably lower, especially when cast against a low-turnout scenario. In line with the FBK’s poll, Putin would only be elected by 45% of Russian citizens – which, nevertheless, is still very high. The last section of the infographic takes a look at the six previous Russian presidential elections, including Yeltsin’s election in 1991 as President of the RSFSR. When juggling with these numbers, one not only needs to be aware that elections in Russia have long been criticised for deficits regarding their freeness and fairness, but also that official election figures may have been doctored. So, how realistic is the Kremlin’s target to obtain a vote share of 70%? With the exception of the 1996 vote, all presidential elections were won in the first round. The respective winners obtained between 53.0% and 71.9% of the vote, with Vladimir Putin accounting for both the lowest and the highest share in 2000 and in 2004, respectively. The 70%-mark is at the upper end of this range and, thus, rather ambitious. When comparing turnout figures, we see a similar picture. Apart from the first free elections in 1991, when around 75% of the Russian electorate participated in the ballot, official turnout figures ranged between 65-70%. Consequently, WCIOM’s and FOM’s current turnout predictions are very high and possibly over-optimistic. The Levada Center’s poll suggests that turnout in 2018 is with 64% only slightly below the comparatively poor turnout of 2004, while the FBK’s projection predicts a gross deviation from the previous pattern. From a historical point of view, the Kremlin’s set benchmark that the Presidentshould gain the approval of 49% of the Russian electorate is very ambitious. Such a result was only seen once in Russia’s electoral history, when Dmitri Medvedev was elected president in 2008. All other presidents were legitimised by a considerably smaller share of citizens: In 2000, only 36.3% of Russian voters cast their ballot for Vladimir Putin, while in 2004 still only 45.9% of the electorate backed his re-election. To conclude, Vladimir Putin is very likely to be re-elected as President of the Russian Federation, if not in the first, then in the second round of elections. The Kremlin’s leaked election target, however, is an expression of the ruling elite’s perceived need for legitimacy. Putin’s victory will ring in a challenging six year period during which the Russian government needs to build-up a successor, if they want to succeed in the next presidential elections in March 2024, when Putin in line with current legislation cannot be re-elected. 12 Comments on "Infographic: Russia’s 2018 Presidential Elections"
Copyright © 2019 governance-blog. Powered by WordPress and Themelia. This site is using cookies to improve your user experience Find out more.